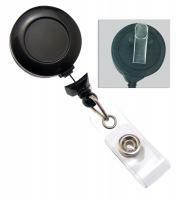 Retractable badge reels are a popular way to attach a badge to clothing for easy access. Available in various styles and colors, badge reels will help you show or swipe your ID card effortlessly at all times. Choose between round, square or even heart-shaped badge reels. Add a touch of color with our wide variety of translucent and opaque materials. Our large selection allows you to find the right badge reels based on your application. We even carry a full line of heavy-duty badge reels for rugged environments. Need unique items? Ask us to customize your badge reels with a logo or any other information that you want. Personalizing your badge accessories will help you promote your company and enhance your brand image. WHAT TYPES OF BADGE REELS DO YOU OFFER? Shapes: round badge reels are very common but badge reels are also available in square shapes. Colors: we offer badge reels in all colors. You can choose a solid color or go for translucent options. Card attachment options: carabiner badge reels are great to secure your cards in a snap. You can also go for reels with a standard strap clip. Heavy-duty: metal badge reels are built to last in all environments. If you need a robust solution, browse our heavy-duty badge reels. DO YOU CUSTOMIZE BADGE REELS? Yes! We offer a full line of badge reels that can be customized with your logo or other information. Browse our large selection of colorful and durable badge reels, send us your graphics and you will get superior print quality at the best prices. Custom badge accessories are powerful tools to promote your company and reinforce your brand image. Potential customers can easily identify your company by knowing at a glance who you are. If you have questions, call us at 1-800-897-7024 and we will answer all your questions.